I had been travelling west along parts of the Silk Road and had reached Dunhuang at the eastern end of the Taklamakhan desert. The town has the feel of a ghost town with its wide empty streets, empty cafes and general air of good times gone bad. 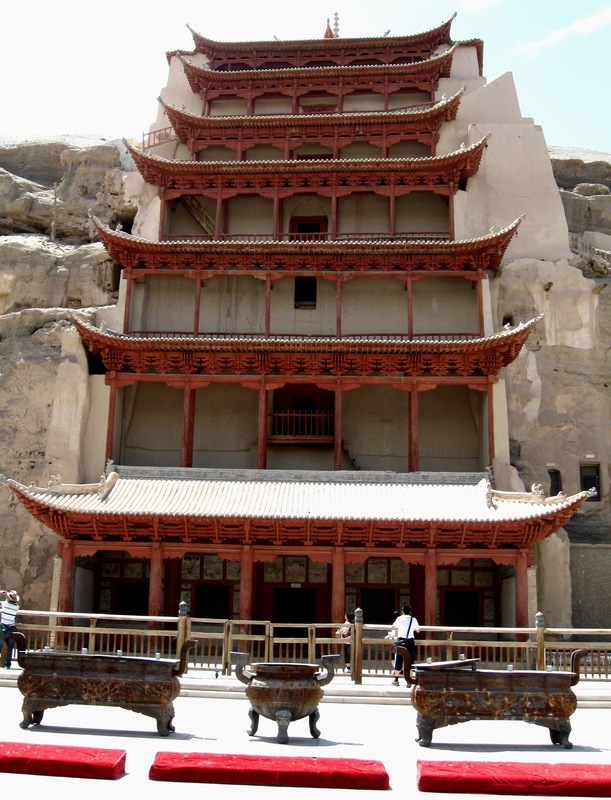 Even the travel and tourist agencies are devoid of people and seem disinterested in offering any information or tours to the Mogao caves that lie on the outskirts of town. But it was not always so. Located at the junction of the northern and southern trails around the Taklamakhan desert, this was one of the most important cities along the Silk Road. In days of yore it was a bustling city teeming with merchants, pilgrims, scholars, musicians, monks, laymen and women and all the infrastructure of the super highway that was the Silk Road. 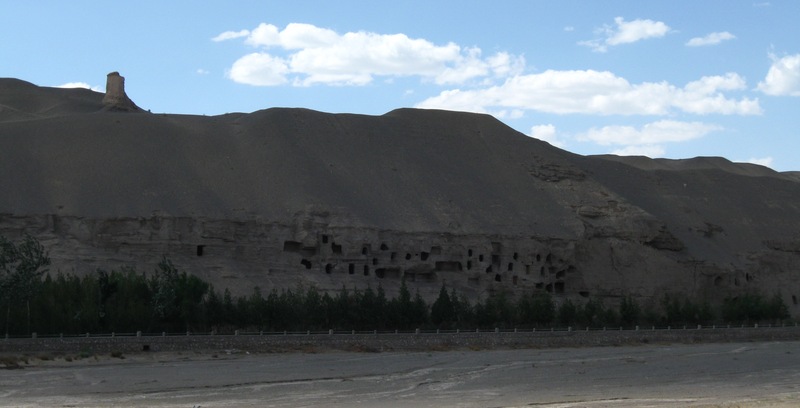 Some distance from the oasis that is Dunhuang, lies an isolated ridge, some two or three kilometers long. Starting in 366 AD kings, queens and rich merchants started commissioning caves to be dug out on this ridge. These were the places that caravans coming to Duhuang would stop at, offer prayers and thanks for a safe journey. If they were about to leave for the months-long or often years-long journey, it was also where they would stop to offer prayers for a safe journey. It is where tourists now flock to see the frescoes and murals in slack-jawed wonder. The entire ridge is riddled with caves. Hundreds of them were built on several levels and each was an elaborate offering to Buddha. The earliest ones are smaller but the latter ones are built on a grand scale. In contrast to many other places and times in history, the successive people did not destroy the previous work; instead each successive dynasty or rich patron attempted to outdo the previous one in size and grandeur. 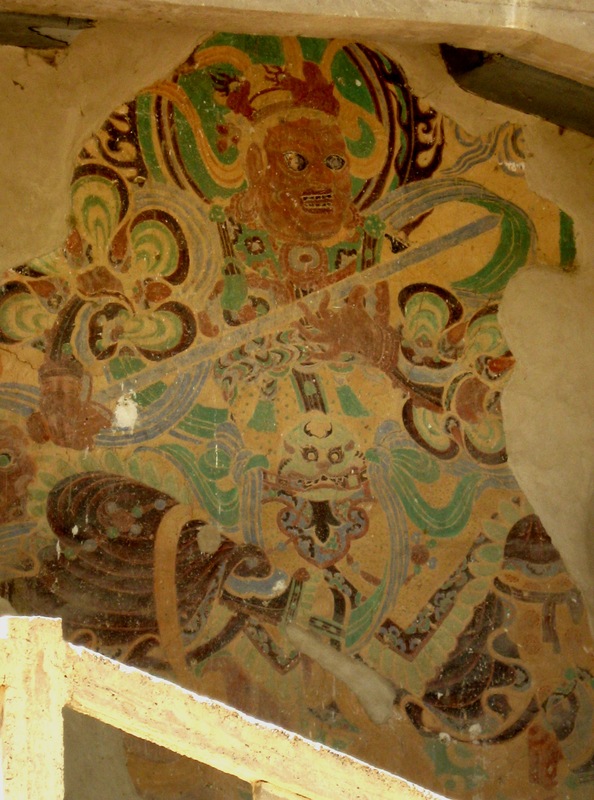 Each cave has a porch at the entry lined with guardian deities in ferocious poses. Beyond the entry is a small passage leading to the main cave. The shape of the cave is square with side walls that taper inward like a truncated pyramid. At the top, some ten or twelve feet up is a small square multi-layered cavity. The walls, the ceiling, passageway, and virtually every inch of space is covered in frescoes and murals. Even the floor is made of carved tiles in lotus patterns. They were probably originally painted in vivid colours but they are now gone although the eroded lotus patterns still show. On the ceiling are thousands upon thousands of Buddha images and on the walls are depicted scenes from Buddha’s life. Sometimes there are scenes from distant lands, probably of the journey made to or from Dunhaung. The earliest ones show distinctly Indian influence in the figures and art while in others I could identify figures that showed a more south-east Asian features. In one cave, the scenes were clearly from central Asia perhaps the Ferhgana valley, in present day Uzbekistan. The gracefulness of horses and clothing of the men harken back to those days. Every single figure or scene is amazing in its details and sheer artistic beauty in colours still vivid after all this time. At the back of each cave is an altar with a seated Buddha with attendants flanking him on either side. A couple of the caves house enormous seated Buddhas, one of which is seven stories tall. The hushed musty, dark interior holds a strange spell as I crane my neck to peer up toward the top. Faint streamers of sunlight come in through the slats in the roof and dust motes dance in the air. One of the largest caves is also the best. It shows a massive thirty meter long figure of Buddha entering paranirvana. Behind him are arrayed a double layer of figures showing mourners. Behind them on the wall are painted yet more figures of mourners. The facial features and clothing speak eloquently of people from diverse countries and cultures. They span the spectrum of the then-known world from India, south-east Asia, Mongol or Chinese or even distinctly European features. It is startling to realize just how far Buddhism had spread – it was revered in just about the entire known world of those days. Travel along the Silk road was almost routine for pilgrims, merchants, traders and travellers. Silk, teas, fruit, gemstones, gold and silver as well as nuts and raisins flowed along the road. But it was not only goods that flowed here. Along with goods flowed ideas and inventions, music and religion and art. This was a veritable super highway. 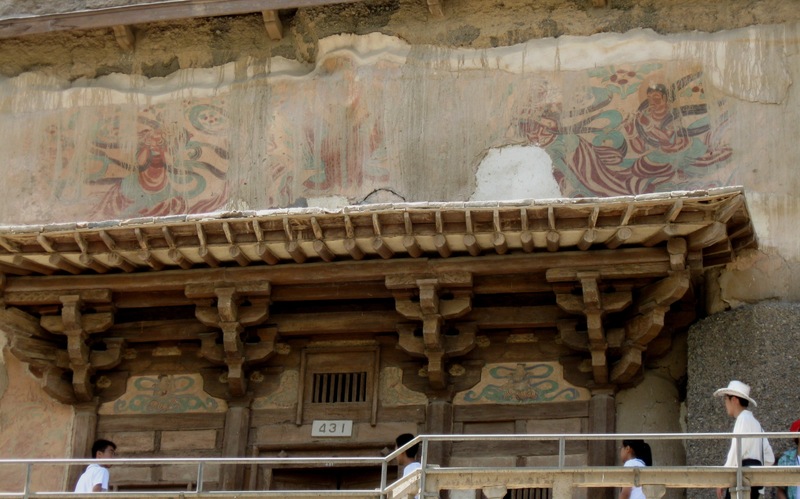 And much of it is depicted on these walls in beautifully painted murals. Entranced, enthralled and captivated was I to see history come alive in front of me! With little effort I could almost imagine myself back in the days of yore hearing the babble of different tongues, smelling the incense and rubbing shoulders with people from far-flung places.